Telephone: +1 916 444 4429. Try to escape from Alcatraz (www.nps.gov/alca), once the site of the USA's toughest maximum security prison and now a national park built on an isolated island in the San Francisco Bay. Alcatraz offers a close-up look at the infamous federal penitentiary via an audio tour, walking tour, and lectures by historians. Ferries depart regularly for the island but bear in mind the only way to get to Alcatraz is by a ferry operated by Alcatraz Cruises, LLC. They're located on Pier 33 in San Francisco. Nighttime tours sell out quickly but add a spooky element to the island. In Sequoia and Kings Canyon National Parks (www.nps.gov/seki), famed for their forests of giant sequoia trees, see the 2,500-year-old General Sherman Tree Giant Forest, the largest tree in the world (by volume) with a circumference of 31m (103ft). Kings Canyon is the deepest canyon in the USA. Joshua Tree National Park was named as a National Monument in 1936. The Park is 234,000 acres of protected wilderness with a variety of hiking trails for beginners and experts, campgrounds, two deserts, and mountain ranges. Geologists believe the area is over a million years old. Joshua Trees themselves are giant members of the lily family. Bobcats, coyotes, and roadrunners call the park home. La Jolla is one of San Diego’s best and most popular beaches. Somewhat protected from the prevailing southwest wind, it's a safe, gentle spot to learn or enjoy surfing. Most of the formal surf schools operate here for this reason, and a lot of local kids practice their basics at the Shores before graduating to bigger and better breaks. Laguna Beach (www.lagunabeachinfo.org), is the 'Riviera of the West Coast' and jewel of Southern Californian beach cities. This charming seaside village is filled with bistros, shops and art galleries, including the famous Laguna Art Museum. 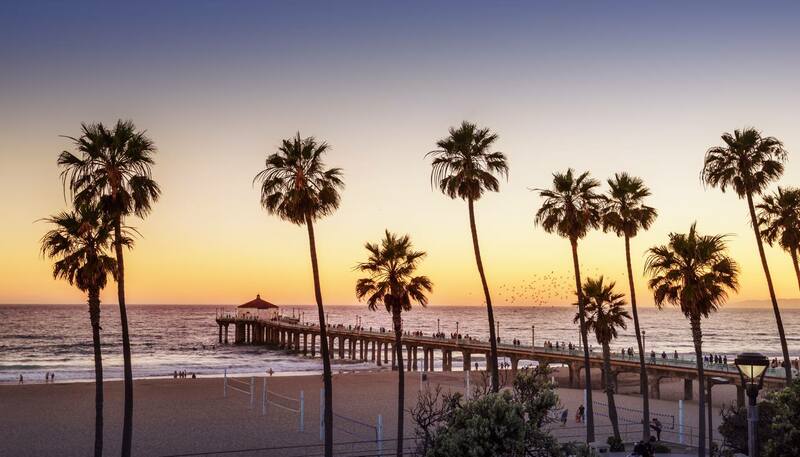 Other famous beaches in California include Malibu,where you can enjoy the picturesque coves, or Marina del Rey (www.visitthemarina.com) for those wanting to admire the flocks of sailboats. Venice Beach (www.venicebeach.com) is an eclectic mix of skaters, street performers and buzzing crowds. Drive the ruggedly beautiful Big Sur coastal highway (www.bigsurcalifornia.org) south of San Francisco. Visit the quaint historic coastal towns of Carmel and Monterey, and eat fresh seafood in waterfront restaurants. Be sure to pull over at one of the lookouts or beaches and scan the sky for California condors and the water for gray whales. Renting a convertible for the picturesque trip is highly recommended. View the famous 1920s sardine factory, Cannery Row (www.canneryrow.com) and Old Fisherman's Wharf (www.montereywharf.com) in historic Monterey. Sample the traditional clam chowder and sourdough bread. See where John Steinbeck found inspiration for many of his classic works and look for seals sunning on the rocks. Be sure to sample at least one bowl of clam chowder. Fish for bass at Clear Lake (www.lakecounty.com), the largest natural freshwater lake in California, known as the 'bass capital of the world.' Clear Lake is one of the most ancient lakes in California, at approximately 2.5 million years old, and has over 160km (100 miles) of shoreline. Attend a local festival, or go waterskiing, fishing, swimming, boating, cycling, birdwatching or rock collecting. Experience the magic of Disneyland (www.disney.go.com) where the imagination is the destination. Become a kid again in an enchanted kingdom home to Mickey Mouse and all of the famous Disney Characters. Restaurants, shopping, shows, and one-of-a-kind rides are fun for kids of all ages and adults who are really kids at heart. Visit Hearst Castle (www.hearstcastle.org) built by newspaper magnate William Randolph Hearst on an enchanted hill overlooking the Pacific Ocean. The property is 40,000 acres of ranch land that includes three guest houses, a renowned European and Mediterranean art collection, magnificent gardens and pools, and an abandoned zoo. Hearst Castle is one of America's greatest palaces. Hike or camp in Yosemite National Park (www.yosemitepark.com), which contains the world's best-known glacier-carved valley, spectacular waterfalls, granite monoliths and the Mariposa Grove of Giant Sequoias. Hike or rock climb the eerily remote Joshua Tree National Park (www.nps.gov/jotr). Cross the Mojave Desert to Death Valley (www.nps.gov/deva), the hottest and lowest place in the continental United States at 86m (282 ft) below sea level. View the famous Hollywood sign in the hills above the city. Film crews can be found on location all over the region, though most of the filming happens behind the well-guarded gates of the various studios scattered across the city. See which celebrity handprints fit yours at The Hollywood Walk of Fame or hop on a guided bus tour to see where the movie stars live. Explore Lake Tahoe (www.visitinglaketahoe.com), set 1,800m (6,000ft) above sea level. Enjoy clear blue skies, snow-capped mountains, and rich culture and history. Ski Squaw Valley and Alpine Meadows (www.skialpine.com) or take a paddle-wheeler cruise across the lake. Visit Little Saigon, the largest Vietnamese business district in the USA. The area features an Asian Garden and a wide variety of French, Vietnamese and Asian shops and restaurants. Pan for gold at the Marshall Gold Discovery State Historic Park (www.coloma.com) where California's 1848 gold rush began. Visit the museum and original and restored buildings at Sutter's Mill in Coloma. Tee off on one of the greens at Pebble Beach (www.pebblebeach.com), which has hosted the U.S. Open five times and is one of the most famous golf courses in the world. This world-class resort has four golf courses with impeccably manicured greens overlooking the ocean. Professional staff offers individual and group instructions. 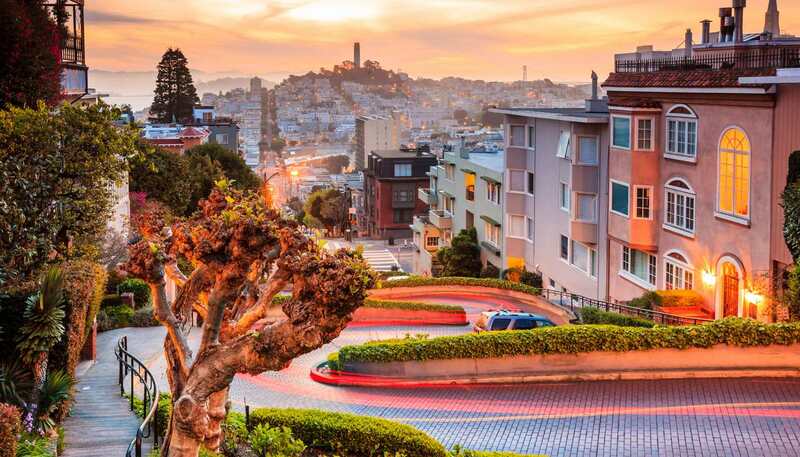 Ride a cable car up and down the steep hills of San Francisco, overlooking the city's glistening bay and Golden Gate Bridge. Cable cars are an iconic part of San Francisco's past that have been preserved as an ideal and fun way to view the city. If you want to ride in the exterior of the car, hang on to the poles and watch out for potential hazards. View the actual cable-winding machinery at the San Francisco Cable Car Museum (www.cablecarmuseum.org). Visit the Roy Rogers-Dale Evans Museum, a frontier fortress full of mementoes from the Western stars' films and television shows. The Route 66 Museum (www.califrt66museum.org) displays a collection of artifacts and photographs related to the famous highway. Enjoy the San Diego Maritime Museum (www.sdmaritime.com) anchored along Harbour Drive, or take an excursion into Mission Bay on a yacht or excursion boat. Explore the world-famous San Diego Zoo (www.sandiegozoo.org), which houses 800 different species. The entire zoo is designed as a 40-hectare (100-acre) tropical garden, and offers many educational programs including nighttime sleepovers and wild animal camps. Walk the Santa Monica Pier (www.santamonicapier.org), the West Coast's oldest pleasure pier, built in 1908, and now an entertainment park with roller coasters and giant Ferris wheel (www.pacpark.com). The pier draws over four million visitors annually who enjoy watching a variety of street performers and artists with a Pacific Ocean backdrop. Below the Pier's eastern deck is the Santa Monica Pier aquarium. See the breathtaking natural wonders of the beautiful Shasta Lake (www.shastalake.com), and the dramatic, snow-capped Mount Shasta (www.mtshastachamber.com), one of the nation's tallest mountains at 4,248m (14,162ft). Shop in Beverly Hills (www.beverlyhills.org), the world's most famous shopping district, and look out for Hollywood celebrities. Taste premium California wines (www.winecountrygetaways.com) in the Napa and Sonoma Valleys, north of San Francisco. Mumm Napa (www.mummnapa.com) is a working winery and vineyard in Napa California with award winning grapes and a picturesque outdoor patio for table service wine tastings. The property also offers guided tours and a photography gallery. Sonoma and Napa Valleys are world famous for their wines and many vineyards are open to the public for tastings.